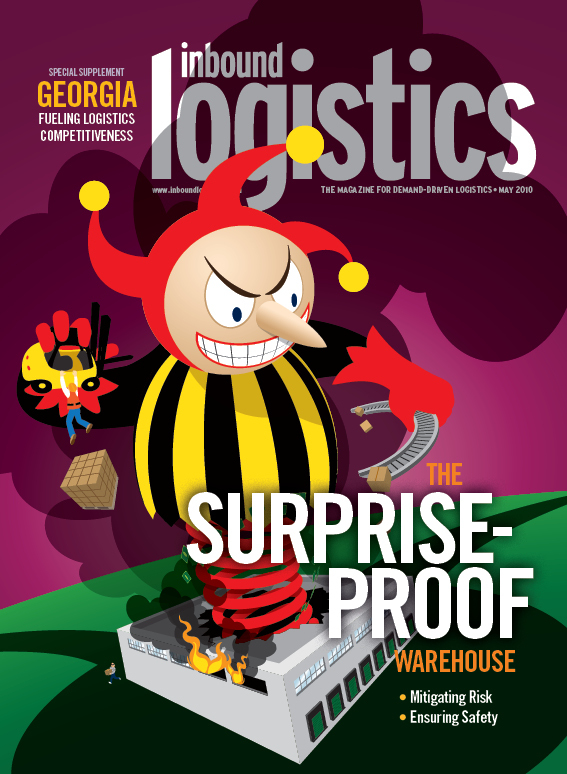 Custom illustration, feature design and cover for Inbound Logistics magazine (May 2010). 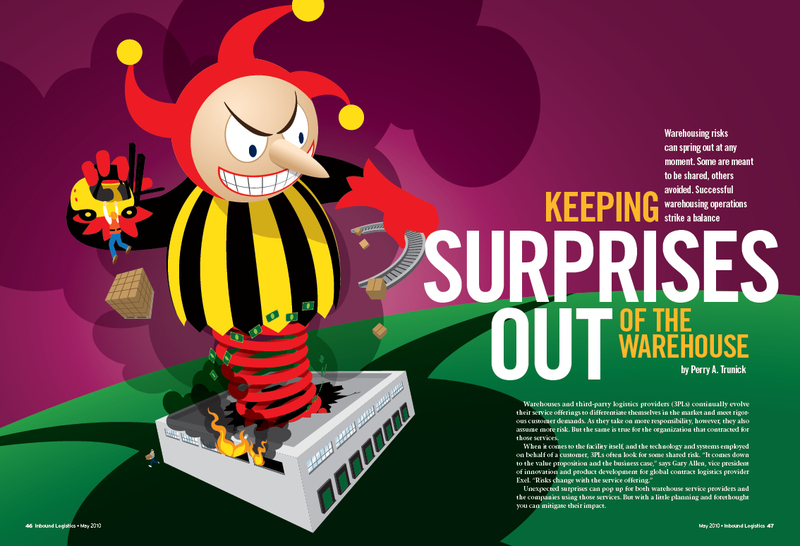 The Design Challenge: Illustrate a magazine feature about warehouse safety and ways to avoid accidents, theft, loss of revenue, and other potential disasters. The Solution: The idea of unwanted surprises springing up at any time made me think of a jack-in-the-box. 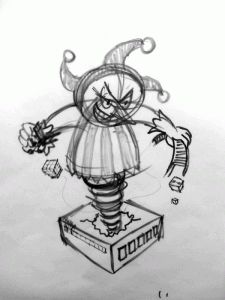 Specifically, a giant, menacing jack-in-the-box crashing out of the warehouse. leaving chaos in its wake. A quick sketch (left) got the idea across to the editor and the concept was approved for both the issue cover and the feature story (above). The Technical Details: The entire illustration was created in Adobe Illustrator CS5. The warehouse building and its various details—windows, truck bays, etc.—was created using the Perspective Drawing feature. “Jack’s” face was created using Illustator’s 3D feature, with the eyes and mouth mapped onto a sphere. The falling boxes, pallet of boxes, conveyor belt, and flying dollar bills were also created using basic shapes rendered using the 3D feature and enhanced with artwork mapped to their surfaces. Some elements were created directly in the computer from the start, while others were sketched by hand, then scanned and used as a tracing image. 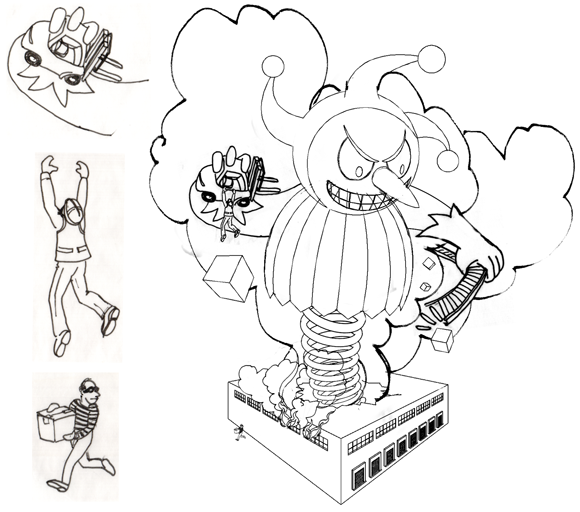 Later in the process, all elements were printed out and combined into a much tighter sketch (below) that was also scanned and used to create all of the elements and small details like the flames in the windows, the worker hanging from the forklift and the thief running from the warehouse, carton in hand. Once all of the vector art was completed, the illustration was placed in the feature layout, then as the cover art (below). To integrate the illustration around the publication logo, a duplicate of the placed artwork was made and all but its smoke layers were turned off in the InDesign layout using the Object Layer Options feature. This created the appearance of smoke rising both in front of and behind the logo.